This article may contain argument names that have not yet been updated for GATK4.Let us know if you run into any problems and we'll fix them. By default the variant callers will only consider a certain number of alternate alleles. This parameter can be relaxed using the --max-alternate-alleles argument (see the HaplotypeCaller documentation page to find out what is the default value for this argument). Note however that genotyping sites with many alternate alleles increases the computational cost of the processing, scaling exponentially with the number of alternate alleles, which means it will use more resources and take longer. Unless you have a really good reason to change the default value, we highly recommend that you not modify this parameter. In some difficult sequence contexts (e.g. repeat regions), when some default-sized kmers are non-unique, cycles get generated in the graph. 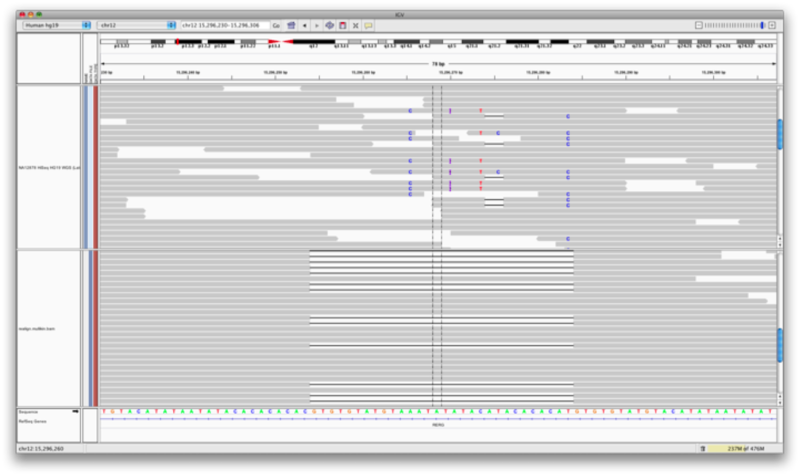 By default the program increases the kmer size automatically to try again, but after several attempts it will eventually quit trying and fail to call the expected variant (typically because the variant gets pruned out of the read-threading assembly graph, and is therefore never assembled into a candidate haplotype). We've seen cases where it's still possible to force a resolution using -allowNonUniqueKmersInRef and/or increasing the --kmer-size (or range of permitted sizes: 10, 25, 35 for example).